I am, by every measure, very good at rampant consumerism. Don’t get me wrong, I only buy when I know that I am going to give away or replace something. And to be fair, when I was invited to do the Sunshine Coast Art Crawl 2011, I wasn’t even thinking of buy any of the art. I just wanted to showcase it in my blog. 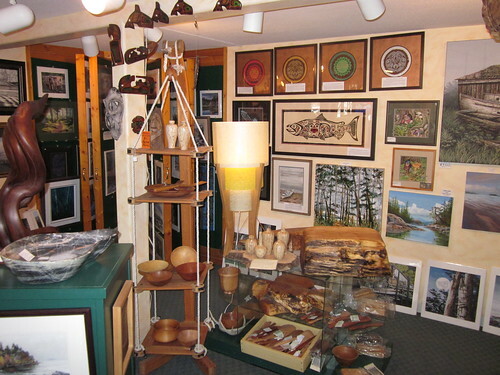 So when we visited the Tug-Ghum Gallery Studio, right on the premises of our beautiful hotel, the Historic Lund Hotel in Lund, BC (on the Sunshine Coast), I wasn’t going to buy anything. 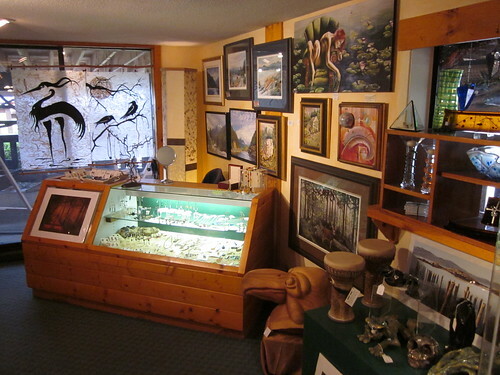 Located in the Historic Lund Hotel is the Tug Ghum Gallery. 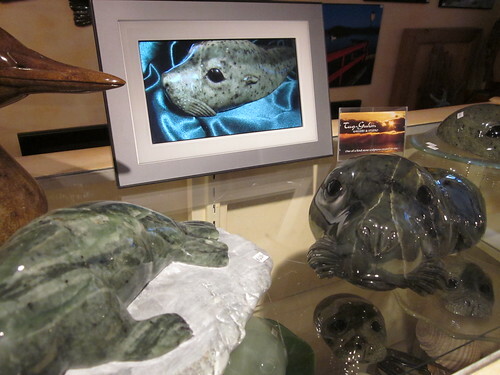 Strong Coastal imagery is the theme of this gallery, with over 40 local artist’s represented and stone carvings created on site by wildlife artist and gallery owner, Debra Bevaart. 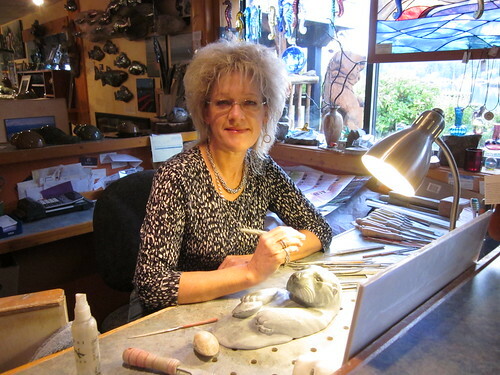 A self taught artist, Debra Bevaart, has painted and sculpted since she was very young. Some of her earliest memories are sketching and drawing British Columbia’s landscapes even as a child. Upon entering high school, she began to explore three dimensional art by sculpting in clay and then carving in a variety of mediums. Pure pleasure is to take a rough stones, realize the form within and then allow that form to emerge. Through years of experimentation and creation, Debra has honed her artistic skills and earned great respect for her ability to capture the essence of her subjects. 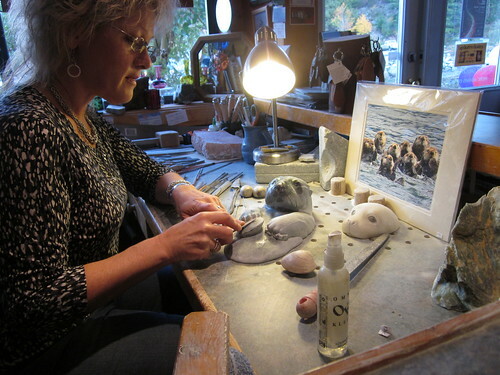 Her keen eye allows her to recreate not only the form and look of the wildlife in their natural habitat, but Debra Bevaart sculptures go one step further and capture the spirit of her subjects. I was completely impressed with her art, and the art she distributes through the gallery. And if you’ve noticed a beautiful silver hummingbird necklace, yes, I bought that at Tug-Ghum Gallery. 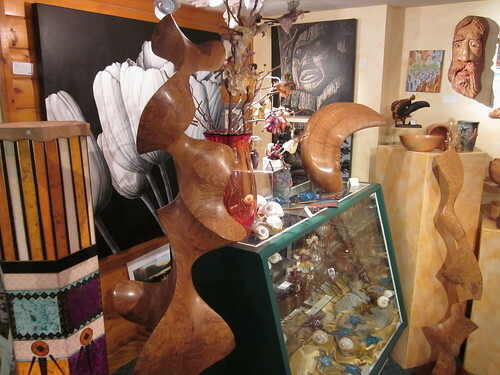 A must-visit location for amazing art on the Sunshine Coast. 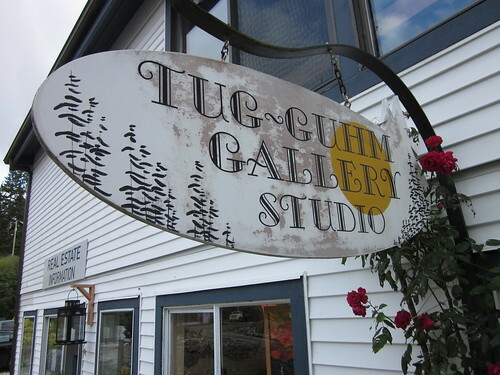 Great article and photo’s of the Tug-Guhm Gallery. It was fun meeting you at various places while we all ‘crawled’. I’m glad you got a tour of the Sunshine Coast and all that it has to offer. Bet you’ll be back. Beautiful exquisit unique gallery hands down my fav gallery. I sell my art here and love the varity of that is in this gallery. Hello Debra, just wondering how things are going with the whale. Please call me at home.